I suppose you don't need a former postal employee telling you that Christmas is on our doorstep, but here I am anyway. I'm not sure whether that's you or your miniature Schnauzer snarling, but either way, I take no offense. 'Tis the season (to be growling). So I'm just going to leave this holiday event guide here, out in the open, with the hope (unlike your online purchases) that it will be taken. Should you answer the doorbell, you will find a freight load of festive opportunities awaiting you and your loved ones. Before you kiss all your free time goodbye — under the mistletoe or otherwise — try to steal a few moments to check out what the area has to offer. No matter what name you know him by (Sinterklaas, Santa Claus, Kris Kringle, St. Nick, or Tim Allen), it's no secret that Santa is better at "adulting" than the lot of us. How else would you explain his insane productivity (cheap elf labor? ), varied interests, and ability to be in multiple places at the same time (quantum physics)? Anyway, he's made a list, checked it twice, and regardless of whether you've been naughty or nice, he is going to show up at the following events at the following times. It's called responsibility — and it's the true meaning of adulthood (whether you've aged a few decades or a few millennia). Photogen-Nick: Santa sleighs — in the upper troposphere, at the box office, and on the red carpet. He embraces his celebrity status as snugly as his belt hugs his belly — so if you ask him for his picture at any of the below locations, you know he'll very merrily oblige. Wednesday 12/6 through Sunday 12/24: Experience it all — or at least an innocent sliver of all experience — at Millcreek Mall. 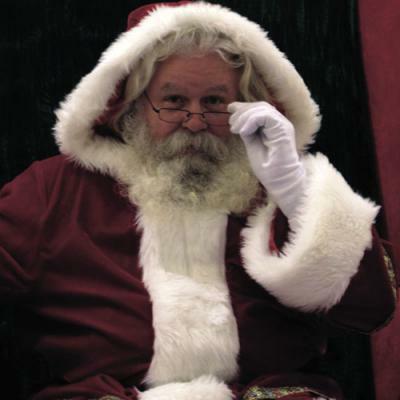 They'll be selling Santa photos and photo packages at their Center Court (no personal photography allowed). Friday 12/9 and 12/16: Santa loves pets and pets love Santa (think of how many chimneys he's crawled in and out of over the years without being mauled). 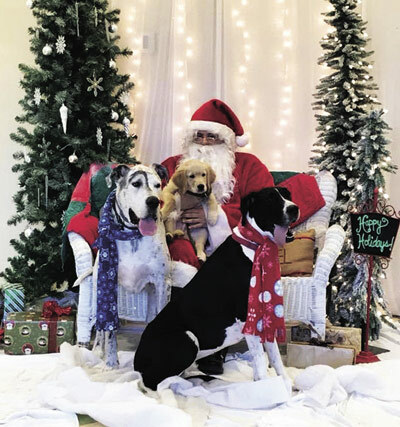 They can pose together at either Tractor Supply Company (Dec. 9) or Pet Supplies Plus (Dec. 16) in a display of interspecies goodwill and cheer. Sunday 12/10 and 12/17: Santa is rarely not hungry — yes, even for Greenland's seasonal delicacy of kiviak, or whole auks fermented for seven months inside a hollowed-out seal. However, pickled seabird is an acquired taste and palates take time to develop. Therefore, Donatos pizza will be served at the expERIEnce Children's Museum's "Lunch With Santa," along with magic from Cliff Hopkins and Kelly. As long as an appetite for magic remains, you'll never grow old. Saturday 12/16: Although kiviak is a temptation we all struggle with, everyone knows Santa's real favorite is milk and cookies. Thus it will be no surprise to find him at Ye Olde Sweet Shoppe's Cookies and Crafts, stopping for a bite (or several). The first 100 kids who join him will receive milk and cookies of their own and a customizable photo frame. Herd mentality: What's the difference between a caribou and a reindeer? It's not a matter of aerodynamics, but domestication — they are actually the same species (Rangifer tarandus), but the latter was tamed 2,000 years ago in northern Eurasia. That said, they're docile enough to be taken out into public — which is more than some of us can claim for ourselves. Saturday 12/9: Sailing, take me away … aboard the Christmas Tree Ship (played by the U.S. Brig Niagara). No word on Christopher Cross' plans, but Kristopher Kringle will be accounted for (along with a few antlered pals) at this hulliday get-together. The evening will feature crafts, drafts (as in letters to Santa, not ales), and caroling — but the focal point is the story of the real Christmas Tree Ship, The Rouse Simmons. The Rouse was lost to a hellacious storm on Lake Michigan in 1912, in the midst of ferrying a load of Christmas trees to Chicago. Its entire crew perished, but the tale lives on — and some say the ghosts with it. Stay warm, stay dry, and stay thirsty (for historical knowledge), my friends. Saturday 12/16: You know Dasher and Dancer and Prancer and Vixen. You know Comet and Cupid and Donner and Blitzen. But you've probably not been introduced to reindeer Baby Yukon and Annebelle of North East's Apthorp Farms, who will join Cupid and Santa at the Church of St. Mark the Evangelist in Lawrence Park for Santa, Reindeer, and Snow Bunnies. Baked goods, candles, clothing, and more will be available for sale to benefit EARS (Erie Area Rabbit Society and Rescue). Hop to it. The O.G. (Original Greek) Bishop St. Nicholas of Smyrna (modern-day Turkey) was noted for his generosity to the poor — in fact, he once spared a Christian man's daughters from a life of prostitution by supplying them dowries for future marriages (allegedly stuffing their stockings with gold coins). Most of us don't have the precious metal surplus to fill knee-highs, but we can still make a difference in our community. And while it's perhaps most genuine to give without expecting anything in return, in most cases, you will be compensated for your charity here. Does your road to canonization go through Erie? Thursday 12/7: It's hip to be square (cubed, rather) as The Bourbon Barrel and street-conscious clothiers The Box host the second annual BOX of Love Fundraising Event, benefiting children in need. Presiding over the ceremonies will be Kwame Dankwa (Star 104) and DJ Proto Malito Proto. Grab a drink from celebrity bartenders Jay Breneman, Jess Scutella, Brooke Ashley Surgener, Ne Riche, or Caitlin Ann Askins and place your bids at the silent auction for fabulous prizes. Or chip a few bills towards the raffle and just enjoy the music. Performing live will be Surgener, Six Year Stretch, Brit Soule (of Dysmorphia), and Yuncapt Barnes. What's more fun than a barrel of monkeys? A barrel of bourbon, especially if it makes you more open to philanthropy. Friday 12/8: The BLOOM Collaborative was formed in 1961 to reintegrate the patients of Stairways Behavioral Health back into the community through art, song, journaling, games, and group activities. Since then, its tendrils have reached out even further into the community-at-large, with one of its marquee events being the annual Holiday Art Show and Sale. Its 14th iteration will offer pottery, paintings, glasswork, fiber/textiles, jewelry, lighting, and sculpture for purchase from a variety of local artists (including BLOOM participants). Wednesday 12/13: If your purpose in life is to party, the Party With a Purpose at Artlore Studios cordially requests your presence. The night will feature (complimentary!) wine and cheese, socialization, and shopping (unique gifts, jewelry, and art pieces from local artists). Hosts Stephen Trohoske and Lena Logvina will be donating the proceeds to Erie DAWN (Dwellings and Advocacy for Women in Need). Saturday 12/16: Are you the type to wear your good deeds on your sleeve(s)? 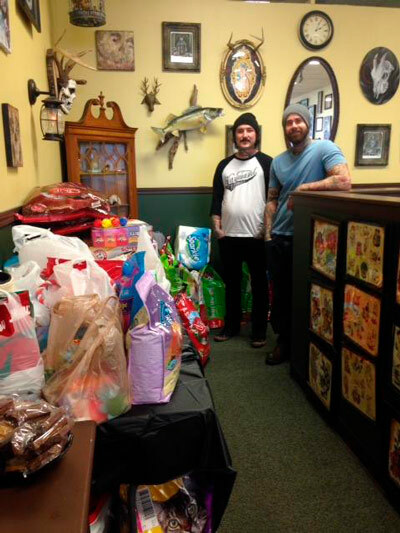 Well then make sure you save space for the Fourth Annual Wayward Christmas Tattoo Drive at Wayward Studios. The premise is simple — give a gift, receive a tattoo of your choice of specially-created designs (which will be posted at the shop the day before). There are stipulations, however — the gift must be newly purchased and will either be a toy (benefiting The Arc of Erie, which provides for children with intellectual/developmental disabilities) or an item from the ANNA Shelter's wishlist (benefiting abandoned/neglected animals). A receipt (proving at least $20 was spent) and your ID must be presented (no minors permitted). The artists will work a rotation and donors will be tatted on a first-come, first-served basis. Feeling cooped up? The depths of winter are yet to come, but cabin fever can descend upon the soul at any time. Life's stresses and obligations can create the sense of being hemmed in. It may behoove you, then, to get some air — if not ozone, at least the rarefied air of human expression. Remember that Ebenezer Scrooge and the Grinch were reluctant at first, but the holiday spirit seeped its way through to even them. Maybe you could get there, too — or at least to any one of these performances. Thursday 12/7 through Sunday 12/10: With an ensemble cast of over 40 students and an student orchestra of over 20, you know you'll score big at the McDowell Center for the Performing Arts production of White Christmas. The musical is based on the 1954 film starring Bing Crosby, Danny Kaye, Rosemary Clooney, and Vera-Ellen, which spawned memorable tunes such as "Happy Holiday," "Blue Skies," "Sisters," "Falling Out of Love Can Be Fun," and, of course, the titular "White Christmas." The soundtrack was originally composed by legendary songwriter Irving Berlin, who saw a remarkable 101 Christmases in his lifetime (not all of them white, presumably). We might not see that many, but we can dream. Friday 12/8: Don't be a manger stranger and stop by a beautifully decorated Our Lady of Peace Church as Penn State Behrend's Young People's Chorus presents its holiday concert, titled "A Great Miracle Happened There." Sunday 12/10: Things will be just as festive on E. 38th St. when the Mercyhurst Civic Orchestra and Mercyhurst Concert Choir wish all A Mercyhurst Christmas at the Mary D'Angelo Performing Arts Center. The program includes Sergei Prokofiev's Lieutenant Kije suite for orchestra and baritone (supplied by guest soloist James Bobick), Antonio Vivaldi's "Gloria" in D Major, and Vaughan Williams' "Fantasia on Christmas Carols." Unlike the honorable Lieutenant Kije (the fictional character upon which Prokofiev's work is based), this show is assuredly not made-up. Tuesday 12/12: Peter Mayer may be a Parrothead, but he's got Christmas on the brain. The longtime lead guitarist in Jimmy Buffett's Coral Reefer Band (since 1988) also presides over a few bands of his own, including the Peter Mayer Trio, Peter Mayer's Songs of Faith, and the Peter Mayer Group, who visits Our Lady of Peace Church on the Stars and Promises "When You Come Home Tour." His style borrows from The Beatles, traditional Indian music, jazz standards, and church hymns. If that's your idea of a cheeseburger in paradise, place your order now. Friday 12/15: If you favor a more irreverent take on the holidays, then the Ugly Sweater Holiday Party at Dramashop will fit you perfectly. Offend the fashion gods with your favorite woolen abomination, partake in refreshments, and enjoy a staged reading of David Sedaris' The Santaland Diaries (adapted by Joe Mantello). This tale tells of a slacker miscast as a Macy's elf during the height of the holiday season. Naturally, he grows increasingly cantankerous as the rush intensifies, taking it out on the parents and children. He only starts to change his tune when a legitimate Santa takes over (as compared to the lechers and drunks that previously filled the role). It's absurdity framed by reality, and more often than not, yes, that's what we've come to. Saturday 12/16 and Sunday 12/17: The debate between money and artistic integrity has always been a tough nut to crack. Although American ballet companies might generate some 40 percent of their annual revenues from Nutcracker performances, some ballet buffs feel as if it's overshadowed newer and more adventurous works in choreographic form. The fact that this argument exists is a testament to The Nutcracker's serious staying power — it debuted in St. Petersburg all the way back in 1892, a collaboration between composer Pyotr Ilyich Tchaikovsky and Marius Petipa (who adapted the story from E.T.A. Hoffman's "The Nutcracker and the Mouse King"). To some it may be overplayed (Pyotr, I'd like you to meet Taylor Swift), but to most it's comfortable, it's charming, and it's quintessentially Christmas. Tchaikovsky's playful, fantastical score is one of the more enduring contributions to Western music and the Warner Theatre is one of Erie's most timeless buildings. The Lake Erie Ballet teams with the Erie Philharmonic and Cathedral of St. Paul choristers to give the people what they want — sugar plums, candy canes, tall hats, sword fights and really well-conditioned beards. Perhaps it's not enough for you to observe magic unfolding onstage; you want to be on the set. Either of these next two events could be the stage crane that drops you into the middle of the scene. Friday 12/15 through Sunday 12/17: Come to the light at the Asbury Woods Winter Wonderland, featuring a gorgeously-lit boardwalk path, unique displays, live performances, storytelling, crafts, refreshments and more. Erie may be too far south for viewing the aurora borealis (ideally), but it's plenty far north enough to see some snow, which would only enhance the spectacle and serenity of the illuminated forest trail (barking dogs, however, would not — thus they must stay home during the event). Through Sunday 12/31: Is your picture-perfect holiday encapsulated by a Norman Rockwell illustration? Then you'll want to paint yourself into the Winter Village at the Chautauqua Institution in New York, which will be radiating warmth like an old coal furnace on each remaining weekend of December (excepting the one directly preceding Christmas). Holiday lights and decor will festoon the village's quaint corridors as visitors are welcomed to shop, ride sleighs and wagons, decorate treats, write letters to Santa, warm themselves by fires (perhaps with wine and hors d' oeuvres? ), and maybe even catch a glimpse of ol' St. Nick himself.